All local governments need to collect measurements in the field quickly, accurately, and safely. But oftentimes this gets hampered by lengthy and inaccurate methodologies, expensive equipment that requires specialized training, or fragmented workflows that hamper cross-departmental collaboration. The GIS and roads departments in Carbon County, Utah, recently experienced huge improvements in their field data collection processes when they implemented Collector for ArcGIS with Spike, a mobile GIS and laser measurement solution from Esri partner ikeGPS. 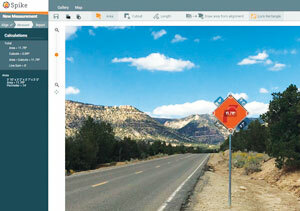 Using ArcGIS Online back at the office, members of Carbon County’s road department can see which signs need to be repaired, removed, or replaced. Daniel Campbell, the road supervisor for Carbon County’s road department, understands the importance of GIS data. In the 17 years he’s been with the road department, Campbell has completed numerous projects more efficiently and effectively by collaborating with the county’s GIS team. One of the road team’s responsibilities is completing an annual signage inventory. This entails visiting every street sign in the county to check and record its condition. In the past, it used to take Campbell and his team six months to conduct an inventory of 1,500 signs—and it cost the county approximately $50,000 each year. To make this more efficient and cost-effective, Campbell turned to Mellissa Lasslo, a GIS specialist who has been with Carbon County’s GIS department for about a decade. Lasslo learned about ArcGIS in college and has been using it ever since. “One of the greatest advantages of using Esri’s software is that…any GIS shop in the world knows how to use it, so anybody can pick up my work where I’ve left off,” said Lasslo. On a mission to capture asset dimensions and photographic records in her GIS data, Lasslo came across Spike, a device that attaches to smartphones and tablets and allows users to take measurements right from their photos. She first heard about Spike while attending a presentation at the 2016 Utah Geographic Information Council Conference, and she was so impressed by its ability to ensure accurate and even real-time measurements that she asked the speaker if she could borrow his Spike. It just so happened that while Lasslo was testing out Spike, Carbon County experienced flooding. So Lasslo and Campbell were able to test Spike during a time-sensitive disaster, and they were impressed by the results. They used Spike’s built-in laser range finder and Bluetooth—which work directly with each mobile device’s camera, compass, and GPS—to measure the depths and widths of road losses and erosion. Moreover, Carbon County was trying to get support from the Federal Emergency Management Agency (FEMA) for flood recovery. Having the measurements readily available, together with a photographic record, made it easier to calculate the amount of material that would be needed for repairs, as well as estimate costs and bid out each project. The county was also able to give its engineering team insight into how flood recovery and damage repair would work best. Although Carbon County did not receive flood recovery funding from FEMA, having all this information at hand helped Campbell and Lasslo determine that their departments needed their own Spike devices and that they wanted them to work in conjunction with ArcGIS. “Knowing that Spike had a GPS capability and was collecting the GPS location of the road damages with each photo, we were pushed to find a way to connect Spike with Collector,” said Lasslo. “Our experience with the flood was the first time we could see what Spike could do for us, and we had the aha moment of using this for the signage inventory project,” added Campbell. 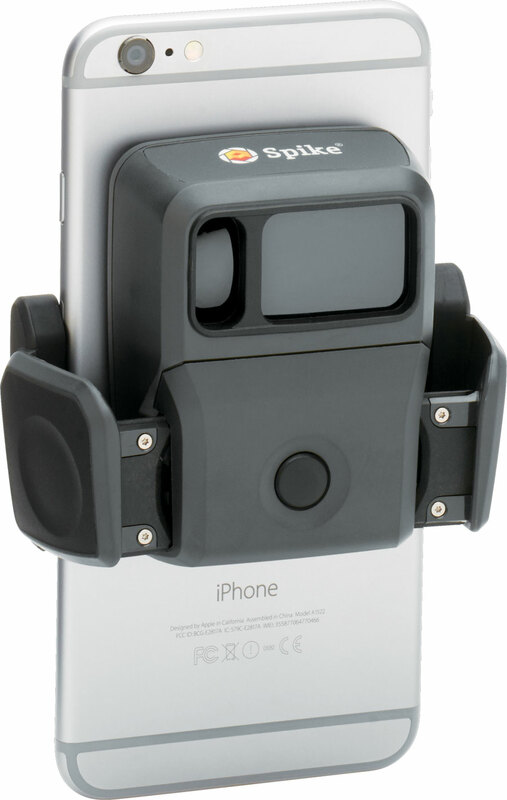 Spike attaches to smartphones and tablets, allowing users to take measurements straight from their viewfinders or photos. Due to high costs and time constraints, Campbell and his team were already behind on the annual sign data collection project. Normally, field teams were required to collect each sign’s GPS coordinates and take its measurements, write them down, and transfer them to a Microsoft Excel spreadsheet on a computer that was plugged into a field generator. They also had to take a photo of the sign and, back at the office, match it with the coordinating sign in the spreadsheet. Finally, they had to embed the photo in that same spreadsheet and add their field notes. Campbell’s team was using multiple instruments—a GPS device, tape measure, ladder, laptop, generator, and camera—to complete what is essentially one task. And none of this was connected to ArcGIS. Once Campbell and Lasslo started using Collector and Spike to complete the signage inventory, the whole process was turned on its head—and the two departments have never looked back. Now, Campbell sends just two team members out into the field to collect sign data. Here’s how it works. One person drives, and the other does the measurement work. When the driver pulls up to a sign, the passenger opens both Collector and Spike. The passenger first marks the location of the sign with Collector and then, with the Spike laser device attached to his or her iPhone or Android smartphone, takes a photo of the sign. From the Spike mobile app, the passenger uploads the photo to the Spike Cloud so that any additional measurements can be taken later back at the office. The passenger also creates a feature in Collector, attaches the Spike photo, and adds notes about the condition of the sign, as well as the measurements taken using Spike. All this data is pushed to ArcGIS Online. If a sign is found to be broken in the initial inventory and is later repaired, the field team can easily go out again to collect a new photo of the sign. The passenger just attaches this Spike photo to the feature in Collector, making it easier for the road maintenance department or attorneys to access the comprehensive photographic history and documentation of a sign. With Collector, Campbell’s team can work off-line as well, which is helpful since the road team needs to cache maps of the entire county while conducting the inventory. Luckily, Collector can store basemaps as layers on each device via a tile package, so the road department’s fieldworkers can be disconnected from both the Internet and the internal network and still have access to maps of Carbon County, complete with road names. Using Spike in conjunction with Collector for ArcGIS, Carbon County’s two-person inventory team can take sign measurements in real time out in the field. After successfully implementing Collector with Spike, Campbell’s road team was able to collect data on 322 signs per day, which amounts to 1,610 per week. What once cost $50,000 now costs $5,000. That amounts to a staggering 568 percent return on investment (ROI) for Carbon County’s most recent sign inventory. According to Lasslo, implementing Collector and Spike together has significantly impacted how the GIS and road departments capture field data. Carbon County’s new and improved sign program has been so successful that other counties want to adopt it and integrate their ArcGIS platforms with Spike. What’s more, Carbon County’s road department is using its joint Collector-Spike solution for so many other projects—from measuring the lengths and depths of trenches and drainage ditches to calculating the widths of road surfaces, sidewalks, and vegetation encroachments on rights-of-way. The solution is also proving useful for when Campbell has to order oversized equipment from the Utah Department of Transportation (which is often), since he and his team can use Collector and Spike to measure and plan out precise routes so they can get accurate permits. For more information about how Carbon County’s GIS and road departments implemented Collector and Spike, email Lasslo at mellissa.lasslo@carbon.utah.gov or Campbell at daniel.campbell@carbon.utah.gov. For more information on Spike, contact ikeGPS senior vice president of sales, James Pardue, at james.pardue@ikegps.com. Vanessa Bagnato is the vice president of product marketing and partner success at ikeGPS.